Do you ever see ingredients at the supermarket that, while you have no idea how to cook with it, you just want to take home and turn into a masterpiece? (Or maybe just something edible?) Okyeahthatsme. 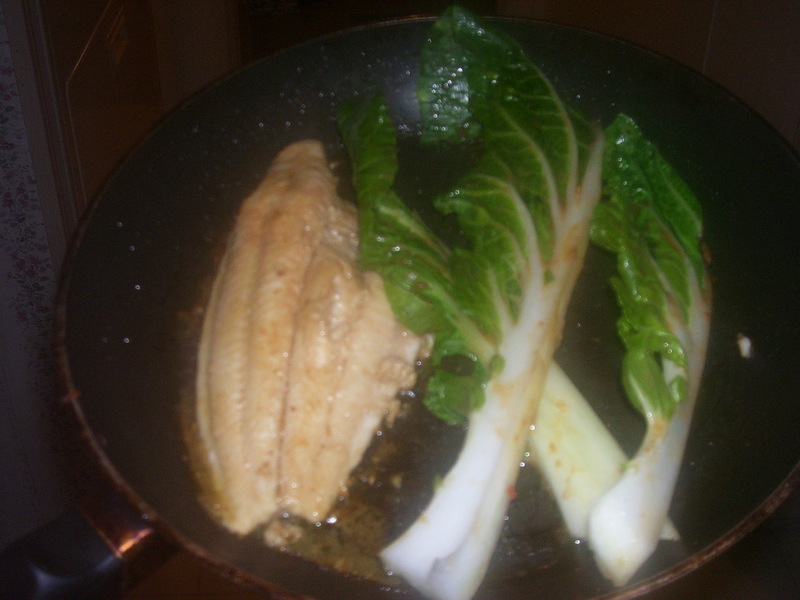 So I find a pretty simple recipe for Miso Glazed Catfish with Bok Choy and I’m game. I LOVE miso soup, so I thought surely I’d like it in a glazed form. Unfortunately, the most difficult part for me was FINDING the miso paste. I’m at least two hours from a Whole Foods Market (it’s a good thing, too, or else I’d spend entire paychecks there), so there aren’t many options in central La. We don’t even have a Farmer’s Market! So I go to Kroger thinking they might have the miso paste. What? No miso paste? Ok. I go to the Bangkok Market, which is basically just a tiny closet attached to the side of the Bangkok Restaurant. I cannot find this stuff TO SAVE MY LIFE. The woman there tells me, and I’m not even joking, “You can’t find? It’s ok. I look with my eyes!” So, after looking diligently with her eyes, she concluded that they didn’t carry miso paste either. Solution? Get the closest possible thing, right? Oh. So. Very. Very. Wrong. I ended up getting fermented soy paste which, I know, sounds awful. I’m pretty adventurous, culinarily (yes I know it’s not a word, I have an English degree!) speaking. I have no problems trying new food. So I take this 16oz hulk-sized jar of fermented soy paste home along with my catfish and bok choy. The results were pretty disastrous, but only on the taste front (which is pretty damned important). 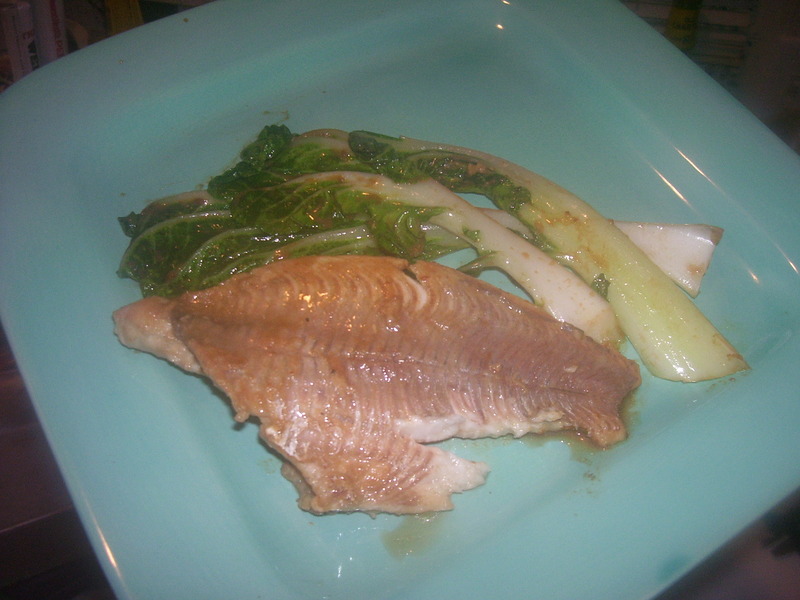 It came out looking like glazed fish, and I learned that bok choy smells kind of nutty and tastes a lot like lettuce. So yeah. Lesson learned – unless you really really really know what replacement you’re using, try to stick to the recipe! Or at least ask the person who looks with their eyes what the hell it is you’re buying. Here’s the recipe for those who want to try it using miso paste. I’m absolutely positive this would be delicious if the recipe is followed correctly. If any of you try it with the right ingredients, let me know and I’ll update the blog. PS – Please don’t mind my shoddy cookware! I’ve got pro knives, now I’m just biding my time until I can afford pro pots and pans! In a medium bowl, whisk together 1 tablespoon of the oil, miso, sugar and 1 tablespoon warm water to make a glaze. Brush catfish all over with some of the glaze. Heat ½ tablespoon oil in a large skillet over medium heat. Arrange two fillets in the skillet and cook, brushing with more glaze and pan juices and flipping once, until cooked through, about 5 minutes; transfer to a plate and keep warm. Wipe skillet clean then repeat process with 1/2 tablespoon more oil and remaining fillets. Reduce heat to medium; add bok choy to skillet and brush all over with remaining glaze. Add 1/4 cup water to skillet, cover and cook, tossing occasionally, until just wilted and bright green, 3 to 4 minutes. 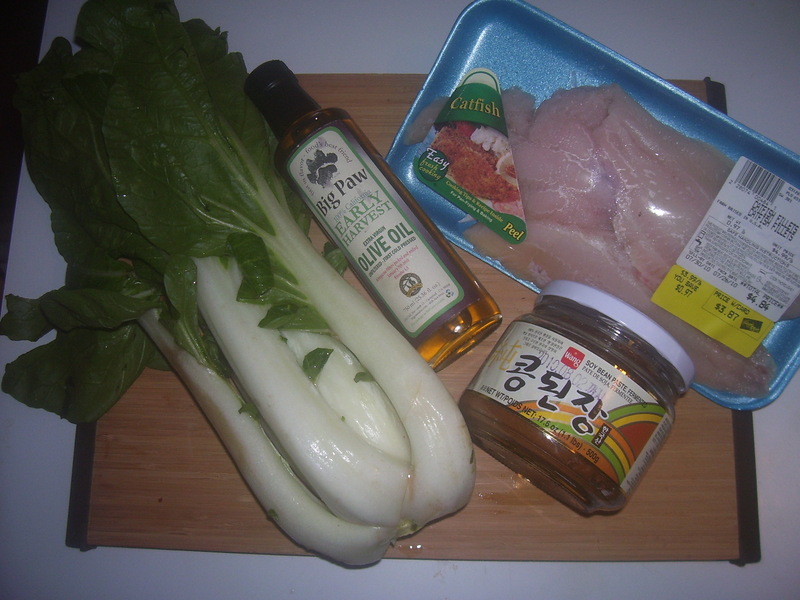 Arrange bok choy alongside catfish and serve. See? It didn't look very scary while it was cooking. Oh, no! That made me laugh, but I’m sorry that your dinner didn’t taste so great. I hope you try it again because miso glazed anything is pretty delicious! I’ve never been a fan of boy choy, it’s kind of watery tasting to me and I don’t want to waste the real estate with it. Don’t worry, I’m sure this won’t be the last post I put in the disaster column. Bok choy was ok for me, even though it was drenched in yuckyyuckypoopoo sauce. I’m going to have to start using that real estate phrase, though!